Please note that this system is compatible with any OEM compatible mid-pipe. 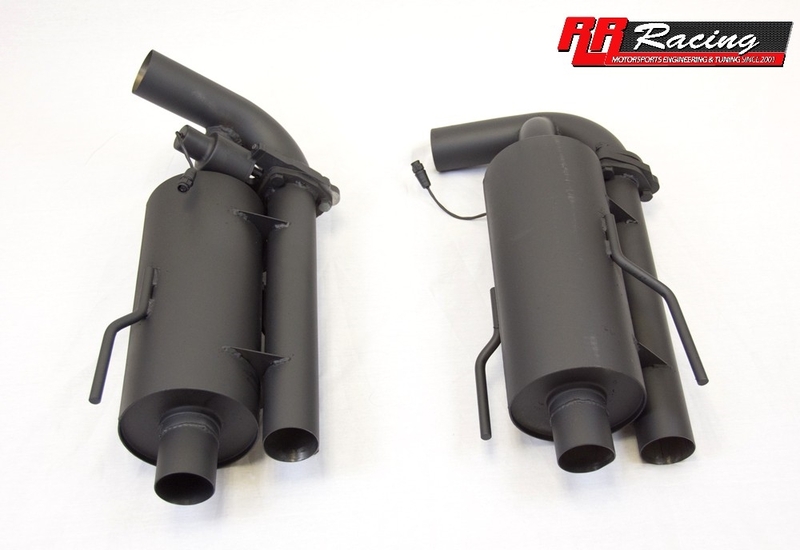 RR Racing is proud to introduce the best sounding and most versatile GS F exhaust on the market. We know there are other “valvetronic” exhaust on the market, but having heard those systems, and considering their astronomical $5000+ pricetag, we decided to design and build our own system that sounds better, and is more affordable! In “Bazooka” mode, our GSF Valvetronic Exhaust is race-car loud, bringing out the full sonorous glory of the GSF v8. The sound is absolutely addictive, much like the popular Borla exhaust, only louder. But as amazing as that sound is, we fully realize that there are times where a more civilized exhaust note is required, so we implemented 2 electronic valves that route the exhaust gases through secondary mufflers. With a push of a button on the remote control key fob, your GSF will go from race car loud to quiet and drone-free in just a few seconds. Our Valvetronic Bazooka features high quality stainless steel construction with 2.5” diameter T304 stainless steel piping, X-pipe for better exhaust scavenging and maximum hp gains, and is 100% made in the USA. Our standard quad tips are 3.5” diameter carbon fiber, and are removable/replaceable in case of damage. Power gains are the similar compared to most 2.5” dual cat-less GSF exhausts, or about 25hp measured at the wheels. 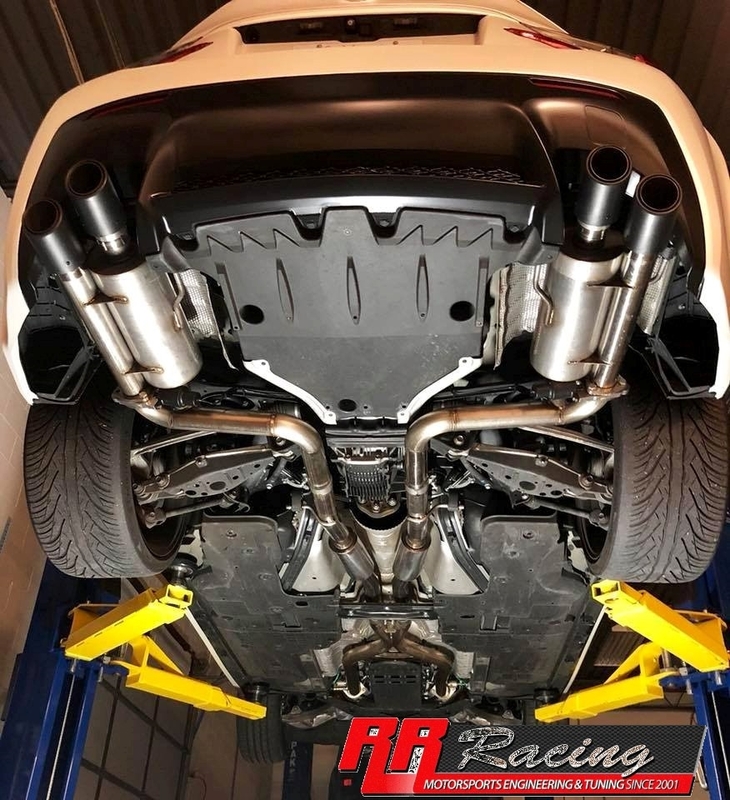 Additional gains are attainable when pairing this exhaust with PPE headers and our ECU tune, or even our 670hp Supercharger kit! RR-Racing cannot ensure the applicability of manufacturer's or third-party warranties after performing this modification. Likewise, RR-Racing does not provide any warranty, written or implied, to the engine or drivetrain of your vehicle. Additionally, certain optional tuning options, such as removal of check engine light (CEL) triggers may be illegal for road use. RR-Racing provides these ECU tuning services for vehicles used in racing and off-road purposes only. RR-Racing does not condone the removal of any emissions related device on vehicles used on public roads. By buying this products, you agree to the terms of this disclaimer.